Basal cell carcinoma (BCC) may exhibit diverse differentiation. 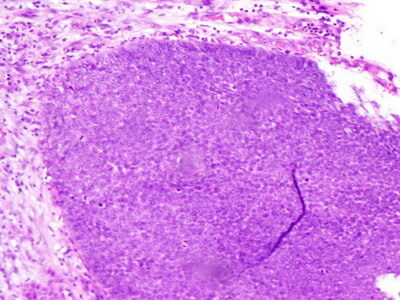 In BCC with matrical differentiation, islands of shadow cells are located within the tumor. Shadow cells, characterized by basaloid squamous cells with a distinct well-defined border and a central unstained area as a shadow of lost nuclei, are characteristic of pilomatricoma, a distinct neoplasm of hair matrix differentiation. The presence of shadow cells within tumor islands composed of follicular germinative cells of an otherwise classic basal cell carcinoma (BCC) has been considered as a distinct diagnostic category of BCC with matrical differentiation. A unique variant of basal cell carcinoma with matrical differentiation. This variant of basal cell carcinoma is extremely rare with less than 15 case reports being reported in literature. It is very important to differentiate BCC with matrical differentiation from other conditions where shadow cells are seen as the clinical management is different. We report a rare case of basal cell carcinoma with matrical differentiation in a 68 year old male and review of the literature. A 68- year male patient presented with pigmented growth on the leg which had been present since 3 months, but started itching and oozing since a month. On clinical examination, a 2 x 1.5 cms nodular ulcerated pigmented growth with irregular margins was seen. The lesion was surgically excised with a clinical diagnosis of squamous cell carcinoma. The H&E-stained sections of the lesion revealed tumor composed of basaloid follicular germinative cells (Fig 1). 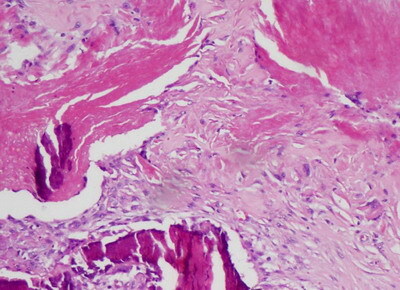 In some areas, there was peripheral palisading and stromal retraction artifact typical of classic BCC. Mitotic figures and apoptotic bodies were present. Many of the tumor cells were heavily encrusted with melanin in the cytoplasm (Fig 2). Elsewhere, the majority of the tumor contained a population of shadow cells having only ghost outlines of the cells without nuclei, similar to those seen in pilomatricoma, with basaloid-appearing matrical cells in the periphery (Fig 3, Fig4). 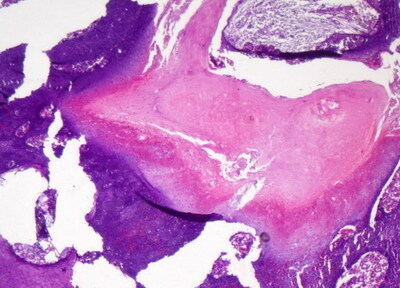 Foci of abrupt keratinisation and calcification suggestive of follicular differentiation were seen. A diagnosis of pigmented basal cell carcinoma with matrical differentiation was made. Fig 3,4: Photomicrograph showing islands of shadow cells, with foci of calcification surrounded by basaloid cells (H&E, 200X). Basal cell carcinoma with matrical differentiation is an extremely rare variant of BCC. As of 2008, a report of two new patients and review found only 12 prior cases of BCC showing matrical differentiation had been reported. The morphological and immunohistochemical features found suggest that basal cell carcinomas with matrical differentiation belong to a spectrum of lesions derived from hair follicles in which beta-catenin plays an important role in the tumor development, differentiation, and behavior. 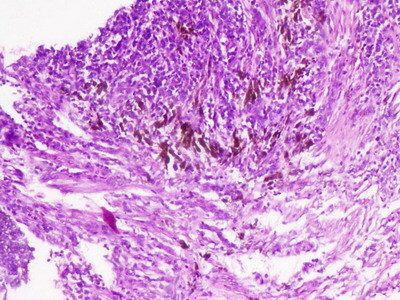 Matrical basal cell carcinoma should be differentiated histologically from other tumors, particularly a pilomatricoma and pilomatrix carcinoma. This distinction can be challenging but is critical as pilomatrix carcinoma can metastasize and cause considerable morbidity and mortality while BCC with matrical differentiation behaves no differently than other BCCs. Absence of prominent nucleoli and only rare mitotic figures argue against pilomatrical carcinoma in this instance. BCC with matrical differentiation is a distinct pathologic entity and a rare subtype of BCC featuring shadow and matrical cells, typically seen in pilomatricoma, a benign hair matrix neoplasm. These cases often present a diagnostic challenge due to confusion with pilomatrixoma or pilomatrix carcinoma. 1. Kwittken J. Shadow cell basal cell carcinoma with acantholysis. Cutis 2002; 69: 57, 63. 2. Zamecnik M, Michal M. Shadow cell differentiation in tumours of the colon and uterus. Zentralbl Pathol 1995;140: 421. 3. Del Sordo R, Cavaliere A, Sidoni A. Basal cell carcinoma with matrical differentiation: expression of beta-catenin [corrected] and osteopontin. Am J Dermatopathol. 2007 5:470-4. Erratum in: Am J Dermatopathol. 2008; 30:317. 4. Ali F, Brown A, Gottwald L, Thomas J. Basal cell carcinoma with matrical differentiation in a transplant patient: a case report and review of the literature. J Cutan Pathol. 2005; 32:445-8. 5. Kim SH, Lee MG, Lee KG. Basal cell carcinoma with matrical differentiation. Yonsei Med J. 2003; 44:523-5. 6. Haskell HD, Haynes HA, McKee PH, et al. Basal cell carcinoma with matrical differentiation: a case study with analysis of beta-catenin. J Cutan pathol 2005; 32:245-50.